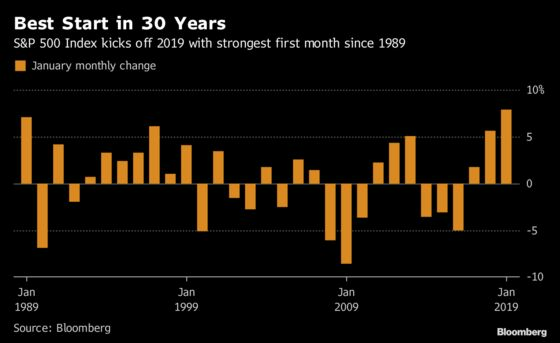 (Bloomberg) -- The S&P 500 Index just capped its best January in 30 years. U.S. stocks rallied on Thursday on the back of stronger-than-expected corporate earnings and a dovish Federal Reserve to post a 7.9 percent advance for the month. That was better than the 7.1 percent gain in 1989, when George H. W. Bush came into office and transit fares in New York City rose to $1.15 from $1.00.